Why are we still using antiquated toilets? I just don't get it. We've seen just about every gadget in our home evolve over the years, but somehow our toilets are stuck in the 19th century. With all the technology advances in the past century, why is it that our toilets still overflow and waste a ton of water when the handles get stuck? It's not rocket science. All it would take to improve toilet technology is to incorporate a couple of sensors, so that the toilet can regulate and monitor the water flowing in, and out. By adding these two simple sensors, toilets wouldn't run all night when the handle get stuck... and they wouldn't overflow because the sensor would shut off the water when the water level is too high. Plungers don't work as well as they should, because they don't make a good seal. Just about every plunger on the market today is round. 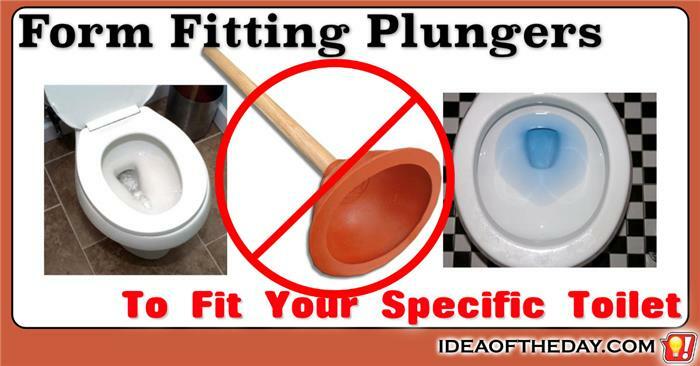 The trouble is, the drain area of most toilets aren't centered in the bowl, so the plunger doesn't make a good seal on all sides, so most of your efforts are wasted. If you go into a typical home center, you'll see so many different styles and drain configurations it's hard to imagine a single plunger that would make a good seal in all of them. The simple solution is for toilet manufacturers to include a plunger that fits the exact shape of each model and include it in the box when you buy it.